The location was in a maple tree in front of my house in Bethesda, Maryland. The "Take It!" 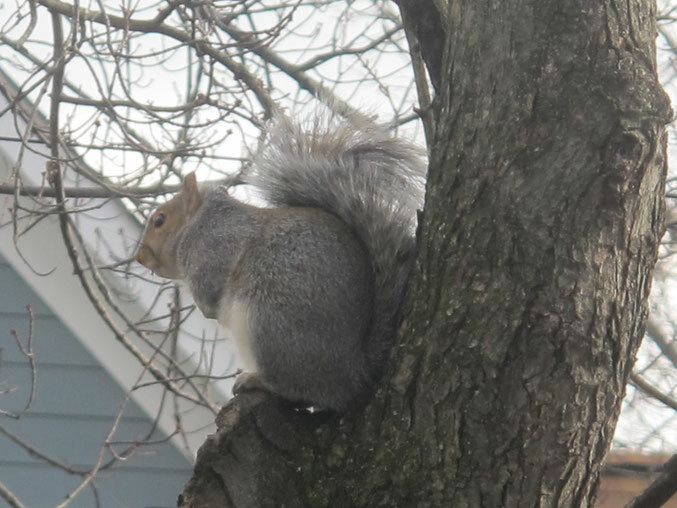 came from the wait of many months to catch sight of this squirrel at a time and location where I might be able to grab my camera and capture its profile. I would have liked to have been able to have done this back when I put together the photo/story " Trick Turns to Treat " but he just was not showing himself when I was looking for him. The pumpkin feast is probably not even a memory for this little guy as over a month has gone by since the feast was presented and consumed. I have not yet seen a study on the long or any term memory of squirrels - lol. The After Take: All who have seen this photo like it very much and think it is a great catch. This is of course after I give them the story of how long I have waited to capture him by picture. I have a name for him and am in the process of making up a little photo story book which someday I hope to be able to offer for sale along with other items I have been fortunate enough to think of. Many of these items have been the subjects of past photo/story presentations on this site. My thanks is very sincere and continued for your comments on the photos presented. Awwwwww how cute, if they weren't such dirty animals they'd make the most adorable pets. We have a black squirrel in our neighborhood. Looks pretty cool. Great shot, but I'd never get that close. I HATE squirrels. They make gardening so tough in spring/summer.